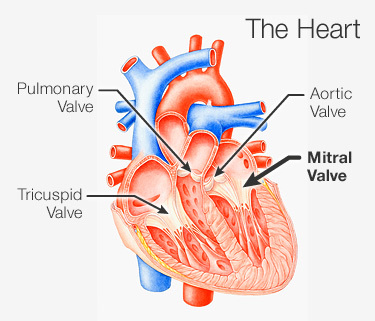 The mitral valve is a valve located between the left atrium and left ventricle and also referred to as bicuspid valve or the left arterioventricular valve. The mitral valve has two flaps and along with the tricuspid valve, it is collectively often called as atrioventricular valves because of their position. The mitral valve helps in controlling the blood flow to the heart. In normal heart conditions during a diastole, the mitral valves usually open because of the increasing pressure resulting due to the preloading of blood inside the left atrium. The opening of the mitral valves helps in the movement of blood inside the left ventricle. After this, the atrium contracts and diastole ends, which pushes out the remaining of blood also referred as the end-diastolic volume of the blood, resulting in the closing of the mitral valve. The closing of mitral valve helps in preventing reverse flow of the blood. 1. Mitral Annulus: Fibrous ring surrounding the opening of the mitral valve is known as Mitral annulus. It is a D shaped structure and connects with the two leaflets of the mitral valve. 2. Mitral Leaflets: The mitral valve comprises of the two leaflets also known as the anterior and posterior leaflet. Both the leaflets comprise of various indentations on their free edges. There are two specific indentations called as anterolateral and posteromedial commissure. These two commissures divide the leaflets into two different types known as the anterior and the posterior leaflets. 3. Commissures: The area located at the junction of the two anterior and posterior leaflets is often called as commissures. 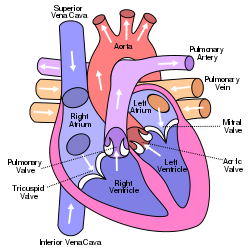 The commissural chordae are the fibrous string that inserts into the area between the two leaflets of the mitral valve. 4. Chordae tendineae: These are the small muscular fibrous strings originating from the papillary muscles or sometimes from the left ventricular valve. These muscular fibrous strings further insert into the mitral wall leaflets. 5. 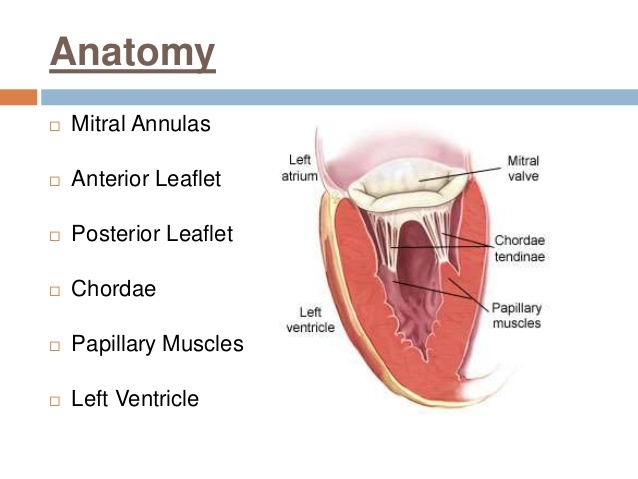 Papillary Muscles: Papillary muscles arise from the left ventricular wall and both these components comprise of the muscular structure of the mitral valve. Papillary muscles are of two kinds: the anterolateral papillary muscles and posteromedial papillary muscles. The anterolateral papillary muscles are larger as compared to the other muscles and are supplied with left circumflex artery and left anterior ascending artery, while the right coronary artery supplies in the posteromedial papillary muscles. The abnormal functioning or conditions arising due to the improper functioning of the mitral valve is referred to as the mitral valve diseases. The function of the mitral valve is to facilitate the unidirectional flow of blood from the left atrium to the left ventricle and preventing the reverse flow of the blood after diastole ends. Any sort of malfunctioning in the mitral valve may result in the reverse flow of the blood into the left atrium, because of which the patient may experience various kinds of symptoms like tiredness, dizziness, and shortness of breath. Furthermore, the ill-functioning of the mitral valve may also result, in inhibiting the regular amount of blood flow from the left ventricle of the heart, thus depriving the body of the regular supply of the oxygen-filled blood. This may result in various life-threatening diseases like heart failure, arrhythmias, irregular heartbeats and several others. The various heart valve diseases are often differentiated on the basis of the dysfunction of the valve involved. The mitral valve is supposed to be the most complex in structure among the four different heart valves and thus, is also the one, which is most frequently associated with the various disorders. Mitral Valve Prolapse: This condition occurs when the two leaflets or the cusps associated with the mitral valve bulge out into the left atrium, instead of properly closing evenly together. This may be caused due to enlarged leaflets or cusps. This condition is often referred to as the click-murmur syndrome, because of the clicking or murmur sound associated with it, when the blood flow suddenly stops when the mitral valves close after atrium contraction. Mitral Valve Stenosis: This condition may occur because of the narrowing down or closing of the mitral valves. This may occur due to aging, due to calcium deposition around the rings of the mitral valves. The narrowing or blockage of the mitral valves results in the backflow of the blood into the left atrium valve instead of flowing into the left ventricle as in normal conditions. The narrowing also causes the lesser amount of blood flow from the heart. Mitral valve regurgitation: This occurs due to the leaking of the blood from the valves, resulting in the backflow of blood into the left atrium instead of the left ventricle, during the ventricular compression. If the situation persists for long, may result in the enlargement of the heart or increased pressure build up in the lungs due to the backflow of the blood. Mitral Valve Stenosis: The most common cause of the mitral valve stenosis in most of the cases is the history of rheumatoid fever in the patient during their early years of childhood. Apart from rheumatoid fever any other factor which may cause narrowing of valves like calcium deposition or aging may be responsible for causing mitral stenosis. The general symptoms associated with the mitral stenosis may be regular episodes of atrial fibrillation, swelling, chest pain, heart palpitations, respiratory infections like bronchitis, fatigue, husky voice, etc. Mitral stenosis often lead to heart attacks, strokes or blood clotting in various parts of the bodies. Mitral Valve Regurgitation: This may be caused due to weakening or the damage to the valve. The damage may be caused due to rheumatoid fever, after the heart attack or after the infection in the inner linings of the heart. The symptoms associated with the disorder may be breathlessness, fatigue, chest pain and coughing. Mitral Valve Prolapse: Mitral valve Prolapse occurs due to enlargement of the leaflets or the cusps of the valve. There is no specific cause associated with this disorder and is supposed to be more widely occurring valve disorder. Often this is found to be running in families and may be found associated with connective tissue disorders, scoliosis, and Marfan syndrome, etc. The symptoms associated are similar to the other valve disorder and the person may experience shortness of breath, fatigue, coughing, heart palpitations and chest pain. Echocardiogram: imaging of the heart using ultrasound waves. Cardiac catheterization: a very fine micro needle-like catheter is made to enter your vessels through your arm or thigh, helps in studying blocked vessels as well. Transesophageal Echocardiogram: in this, a microfine thread like device emitting ultraviolet rays is passed through the oesophagus, which is located behind the heart. Holter monitoring: monitoring the electrical activity of the heart using a micro monitoring device for a specific time period of 24 -48 Hrs. Anticoagulants: used as a thinning agent for blood. Diuretics: used to lower down the accumulation of fluids in the lungs. Beta Blockers: used to lower down the irregular heartbeat rate. Valvuloplasty Technique: In extreme conditions, certain medical procedures may be used to combat the effects due to structural changes in the mitral valve. For example, in the case of mitral stenosis, where the valves get narrow or blockage occurs, balloon valvuloplasty may be used. In this technique, a balloon is used to open up the blocked valve. Surgical Treatment: In some cases, surgery might be required to make correct structural changes in the mitral valve. In extreme situations, there might be a need to replace the mitral valve with a new one. This may be a biological or mechanical replacement. In the case of biological replacement, the new mitral valve may be used from a cow, pig or a human cadaver. What are the general symptoms associated with defective Mitral Valve? In general, most of the time, the mitral valve disorders go unnoticed, as many of the patients do not show any symptoms, even when the leak in the mitral valve may be severe. In extreme conditions, the patient may experience shortness of breath, fatigue, and tiredness, coughing and chest pain. What may be the indications for a surgical treatment for the defective mitral valve? Surgery is considered as an option for the patients who have severe leaking in the Mitral valve. The leaking is usually measured on a scale of 0-4, where 3 represents moderately severe and 4 represents extremely severe condition. Surgery may also be required when the patient is diagnosed with an increase in heart size, irregular heartbeats, and a decrease in the heart activity and blood flow. What are the risks associated with Mitral valve surgery? Usually, the surgical treatment improves the long-term survival of the patients suffering from severe mitral valve diseases. The risks associated with mitral valve surgery for asymptomatic patients in 1 in 1000. In 95 % of the cases, surgical treatment has been found to be successful in patients suffering from congenital mitral valve disorders. Having previous heart disease history or coronary artery disease may attribute to an individual risk associated with the surgery. In general, 95 % of the patients do not require to be re-operated for at least another 10 years.